Heart transplant surgery is a common medical treatment in the United States. 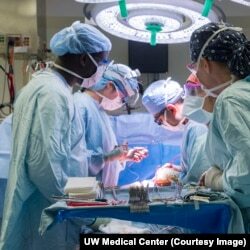 Some doctors are skilled at removing the heart from someone who has just died, and then preparing it for another person who needs a new heart. 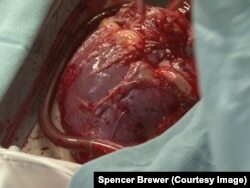 Nationwide, about 4,000 new patients a year are listed for a heart transplant. But only about 2,500 are able to have the operation. 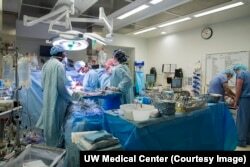 Dr. Jay Pal transplanting new heart at UW Medical Center, Seattle,WA. Sept. 16, 2015.The donated heart had traveled in the new box. Jason Smith is a surgeon with the University of Washington Medical Center in Seattle. He notes that because of the difference in numbers, not all patients on the transplant list will live. There is a shortage of organ donors. Some people do not want to donate their organs or those of a loved one. But also, some donated organs do not make it to the surgery room in the right condition for transplant. Once the organ is removed from the donor, there is only a short time to get the organ to the person who needs it. The average length is four to six hours. After that, the organ begins to fail. This can be a problem if the donor died far away from the recipient. Traditionally, the donated hearts are transported in an ice box. Keeping the organ on ice has been the best way to preserve it. Medical workers sometimes carry the box on a helicopter or airplane. Medical workers examining a donated heart pumping, sealed in a new transport box. UW Medical Center, Seattle, WA Sept 16, 2015. Now, a new travel box contains equipment that keeps the heart beating during transport. The only time it stops beating is for a few minutes -- just before it is placed into the chest of the person receiving it. For more than a year, the Organ Care System has been tested in the United States. The system, also known as “heart in a box,” has an American manufacturer, a company called TransMedics. It is already available in Europe and Australia. Dr. Jason Smith is pleased about the addition of transport pumps on the boxes. Ted Daniels is also pleased with the “heart in a box.” He was the first patient to get a heart through the Organ Care System in the U.S. trials. 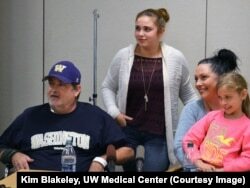 Daniels, a truck driver from Washington State, received his new heart in September 2015. A month later he spoke to the news media. Daniels said he was “excited” to be part of the new patient technology. He said, "It makes me happy to know that I'll probably get to see my daughters (ages 16 and 7) graduate and get married." The equipment has been tested on flights up to 11 hours long. The machine pumps donated blood through the organ, so it can work as it does inside a body. Those traveling with the heart watch it closely to make sure it is in the best possible condition for transplantation. Dr. Jay Pal preparing patient Ted Daniels for transplant heart. Donated heart in the box on the right. Sept. 16, 2015, UW Medical Center, Seattle, WA. The development of this new heart travel machine is good news to Kevin O’Connor. He is the head of Lifecenter Northwest, a group that organizes organ and tissue donation in some Northwestern states. TransMedics is also testing the technology to help preserve donated lungs and liver organs. Similar to the way that hearts are kept beating in the box, the lungs “breathe”, and livers “produce bile,” according to the company’s website. It adds that if an organ is beginning to fail, the machine may be able to bring it back to a fully functioning condition. That would give doctors more organs for transplantation. 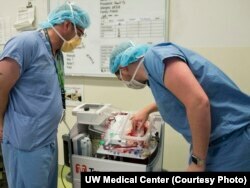 Doctors say the new technology alone will not end the need for more donated hearts. They are urging Americans to register to become an organ donor. Zlatica Hoke reported this story for VOA. Anne Ball adapted for Learning English. George Grow was the editor. See how well you understand the story and develop your listening skills by taking this listening quiz. Play each short video and then choose the best answer.